The village is near to many transport routes important in their time, which has influenced its unusual nature. Deanshanger is only 5 miles from Watling Way, the Roman north to south route, and the main Oxford to Stony Stratford road passed through the village. Wolverton and its once famous Railway works is 5 miles away. 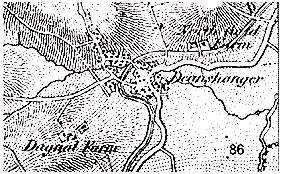 In 1801 the opening of the Buckingham arm of the Grand Union Canal brought a transport route of heavy goods directly through the village. In 1820 a local family of blacksmiths, from the nearby village of Wicken, started to expand their business into the Roberts Iron Foundry of Deanshanger, also known as the Britannia Ironworks. The Roberts Foundry flourished to become prize winning, agricultural implement makers and engineers of world renown. Their success lasted 100 years and despite a major fire in 1912, the First World War helped the Ironworks to boom. However decline started in 1924, Roberts could not survive the Depression and went into liquidation in 1927. The site lay empty for nearly 10 years when many local children were able to use it as a giant playground. However the beginnings of the Second World War, heralded more changes for the site. The Wreschners, refugees from Nazi Germany bought the site in 1937 and established an Iron Oxide works for pigment production. Once again it was a family business and the Wreschner family were paternalistic towards the small village which became their home. Iron Oxide pigment production was carried out at very few sites in the world and once again the Deanshanger product was exported all over the world. The centre of the village became characteristically stained red. 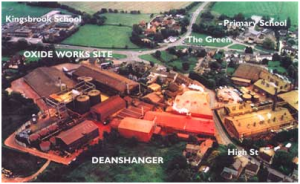 In the early 1980s the Wreschners were bought out, but production carried on until 1998 when the building of a site in China superseded the Deanshanger site. Demolition of the site began in 1999 and was complete by early 2000. The area has now been replaced by the construction of several new housing estates. Thus the villagers have seen the passing of the iron heart of the village, which typified Britain's industry of the last two Centuries.